William Satterlee Pye was born in Minneapolis, Minnesota, on 9 June 1880. Entering the U.S. Naval Academy in 1897, he graduated in 1901 and was commissioned an Ensign in June 1903. 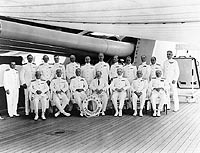 During 1901-1915 he served in several ships, among them five battleships and an armored cruiser, and was also assigned to the staffs of the Naval Academy and Naval War College. In 1915-16 he placed the new destroyer Jacob Jones into commission, commanding her until early 1917, when he joined the staff of the Atlantic Fleet's Commander in Chief. He served in that position through the First World War, receiving the Navy Cross for his performance. Pye was on duty with the Office of the Chief of Naval Operations during 1919-21, and was Executive Officer of the battleship Pennsylvania in 1922-23. After briefly commanding a destroyer squadron, he returned to Washington, D.C., for further Navy Department service that lasted into 1927. 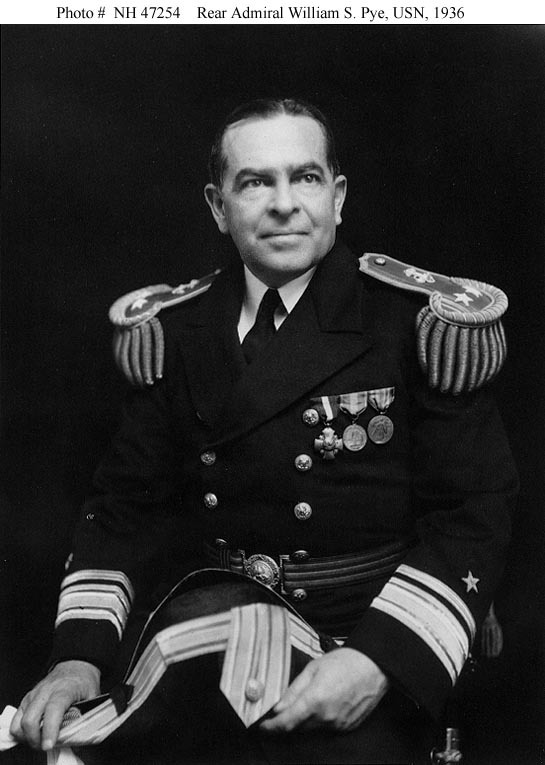 In the next five years, he commanded the minelayer Oglala, had more Navy Department duty and was head of the U.S. Naval Mission to Peru. 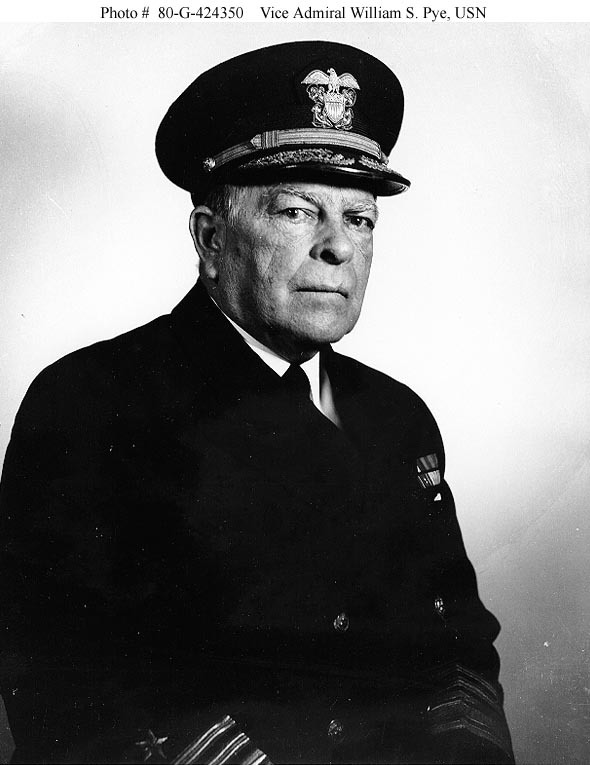 Captain Pye was Commanding Officer of the battleship Nevada in 1932-33. 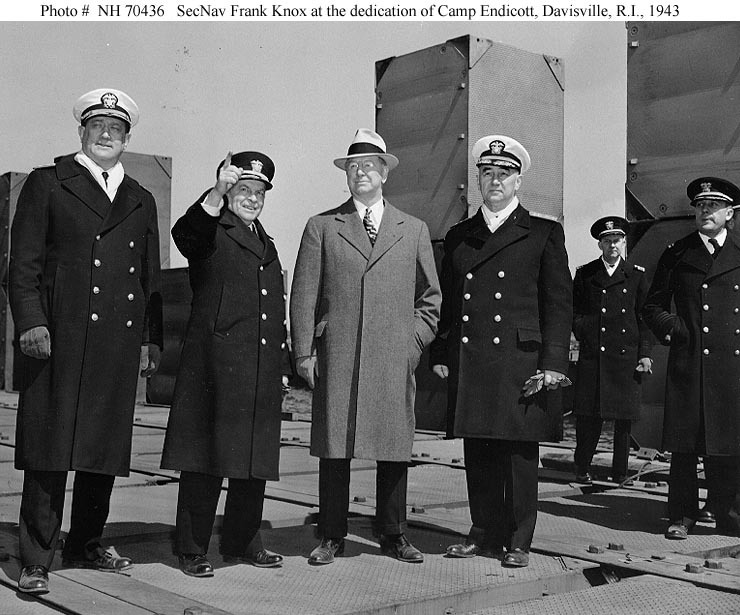 Promoted to the rank of Rear Admiral, Pye served as Chief of Staff to Commander Scouting Force, attended the Naval War College, had further Navy Department service, and was Commander Destroyers in both the Scouting Force and Battle Force. 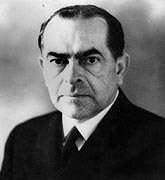 With the temporary rank of Vice Admiral, he was Commander Battleships, Battle Force in 1940 and Commander Battle Force in 1941. 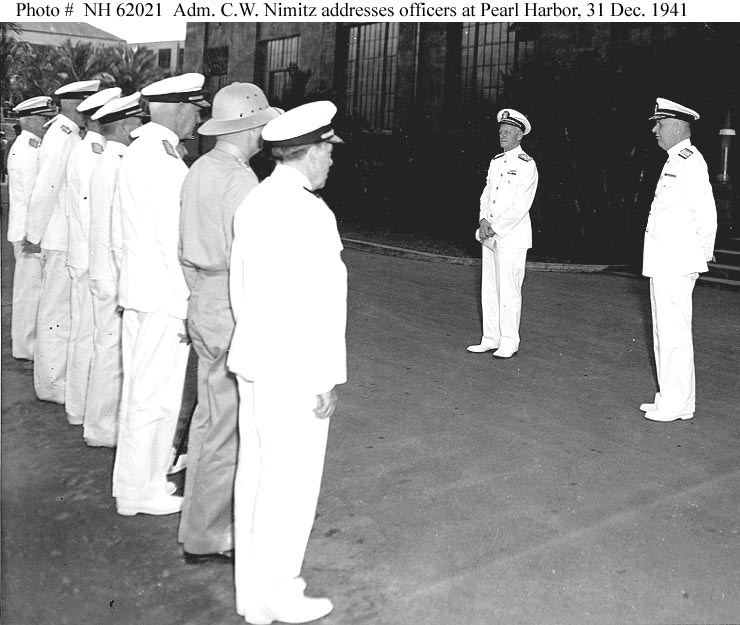 Following the Japanese attack on Pearl Harbor on 7 December 1941 and the subsequent relief of Admiral Husband E. Kimmel, Vice Admiral Pye was Acting Commander in Chief of the U.S. Pacific Fleet from 17 December until the last day of 1941. 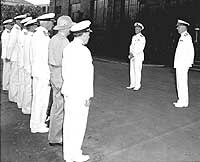 He continued to lead the Pacific Fleet's Battle Force until October 1942. Vice Admiral Pye then became President of the Naval War College and simultaneously commanded the Naval Operating Base, Newport, Rhode Island. 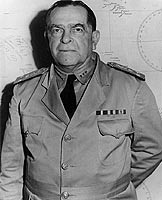 Though he officially retired in July 1944, he remained on as War College President until relieved of active duty in December 1945. 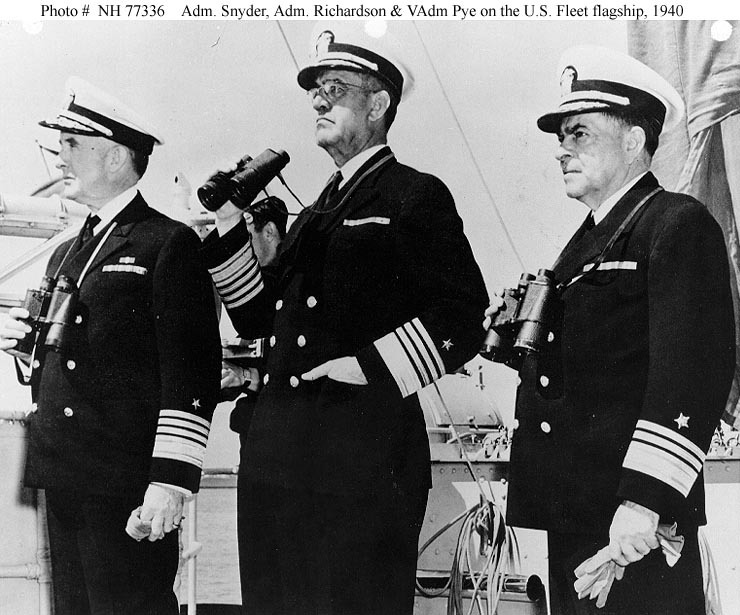 Vice Admiral William S. Pye died at Bethesda, Maryland, on 4 May 1959. 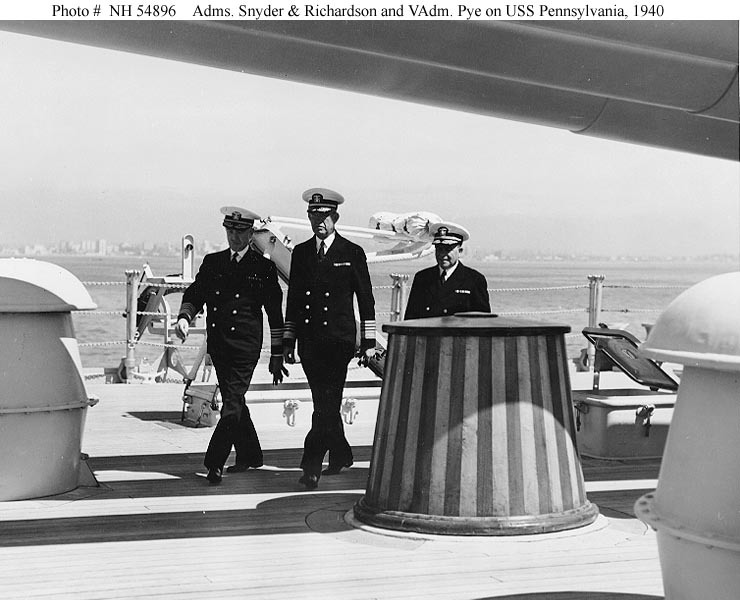 This page features selected views of Vice Admiral William S. Pye, USN. Photographed in Special Full Dress uniform by the Ernst Studio, circa 1936. His medals include (from left to right): Navy Cross; Spanish Campaign Medal, 1898; and World War I Victory Medal. Photographed at Pearl Harbor, circa late 1941 or early 1942. 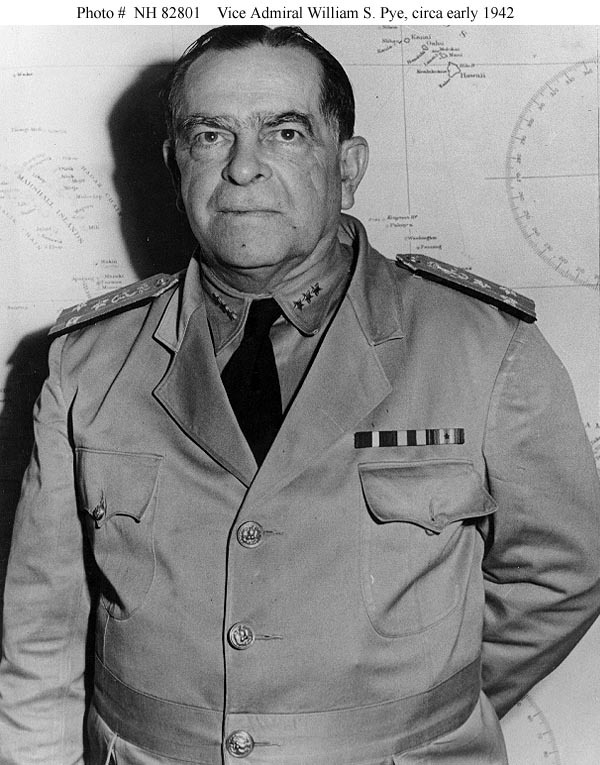 He was Commander, Battle Force from January 1941 until October 1942, and served as Acting Commander in Chief, U.S. Pacific Fleet during 17-31 December 1941. Copied from United States Naval Administration in World War II, Commander in Chief, United States Pacific Fleet and Pacific Ocean Areas, Appendix Volume I. Photograph received by the Naval Photographic Center in January 1951. It was actually taken during World War II, probably while VAdm. 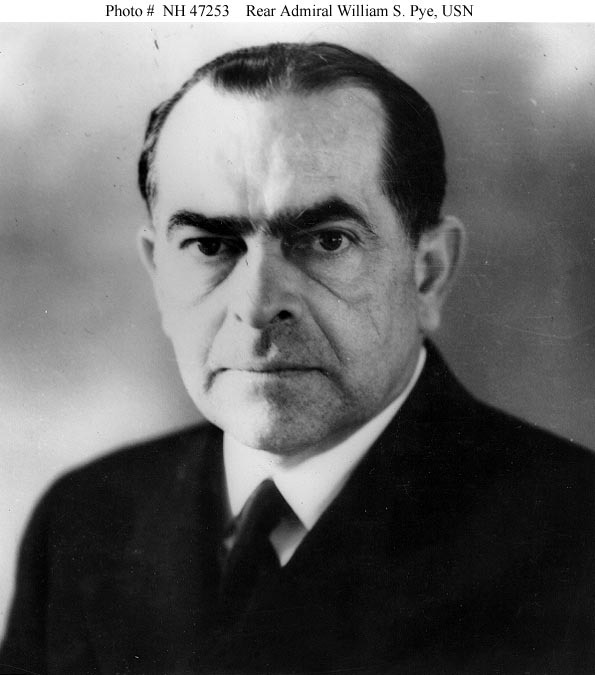 Pye was President of the Naval War College. 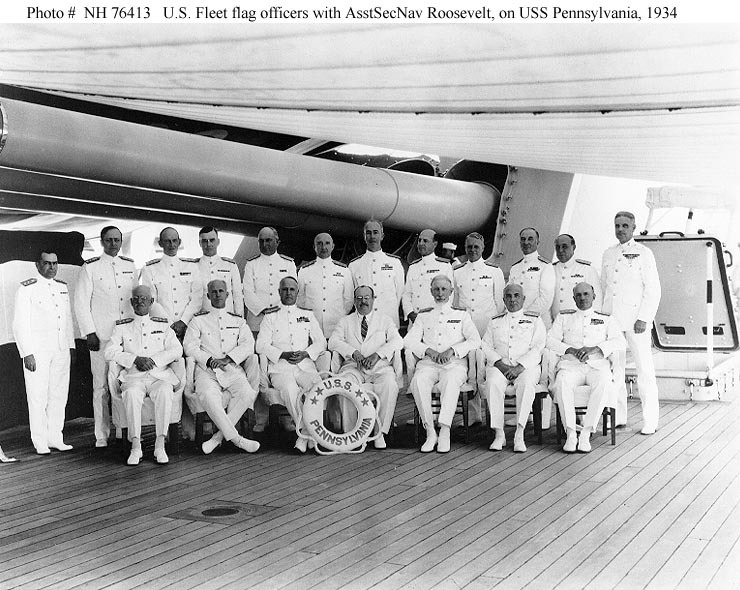 With other U.S. Fleet flag officers, on board USS Pennsylvania (BB-38) in the Spring of 1934. All those present are identified in Photo # NH 76413 (complete caption). Courtesy of Rear Admiral C.H. Lyman, USN(Retired), 1972. Studies a chart of "Cape Flatery to Dixon Entrance" and Fleet Problem instructions on board his flagship, USS Pennsylvania (BB-38), circa January-May 1940. 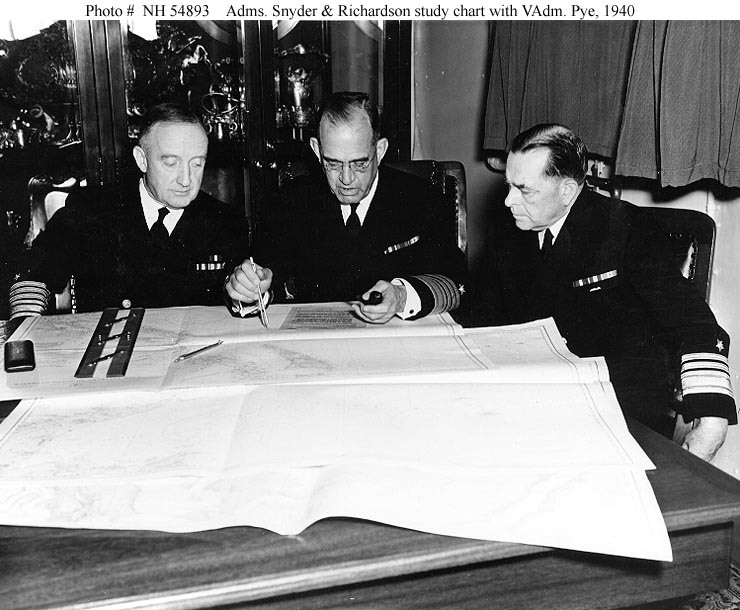 With him are (at left) Admiral Charles P. Snyder, Commander, Battle Force, U.S. Fleet, and (at right) Vice Admiral William S. Pye, Commander Battleships, Battle Force. 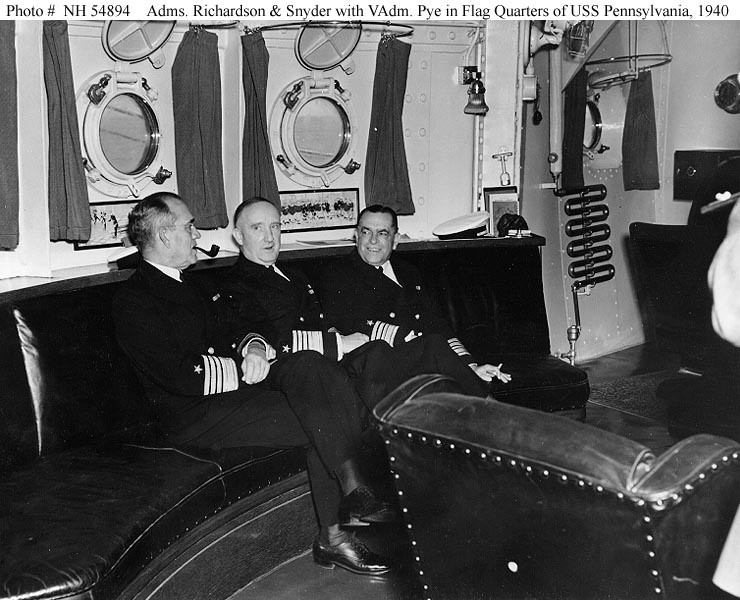 Relaxing in Flag Quarters on board his flagship, USS Pennsylvania (BB-38), circa January-May 1940. 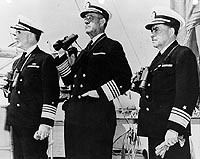 With him are (center) Admiral Charles P. Snyder, Commander, Battle Force, U.S. Fleet, and (right) Vice Admiral William S. Pye, Commander Battleships, Battle Force. 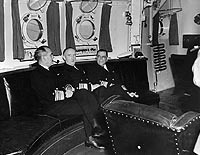 Note pipe radiator on the bulkhead, to the right, open porthole covers and leather-covered furniture. Observes fleet maneuvers from on board his flagship, USS Pennsylvania (BB-38), circa January-May 1940. 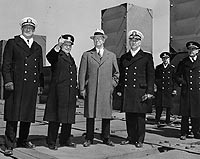 With him are (left) Admiral Charles P. Snyder, Commander, Battle Force, U.S. Fleet, and (right) Vice Admiral William S. Pye, Commander Battleships, Battle Force. Takes a turn around the deck on board his flagship, USS Pennsylvania (BB-38), circa January-May 1940. 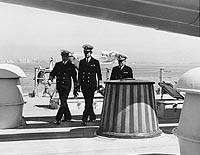 Accompanying him are (left) Admiral Charles P. Snyder, Commander, Battle Force, U.S. Fleet, and (right) Vice Admiral William S. Pye, Commander Battleships, Battle Force. Note fancy capstan cover and 14" gun barrels overhead. City in the distance is probably Long Beach, California. 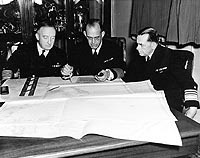 Rear Admiral Randall Jacobs, Chief of Naval Personnel (right).